"It would be nice," Anderson said when asked if he wished he could go straight into the Ashes series. "If I can keep working at my game and continue the form I've shown since the start of the summer hopefully I carry that on through the whole season." Australia announce their touring party tonight, but for the moment, Anderson has not put much thought into who he might be coming up against in seven weeks' time. "There's not been much talk about it to be honest. We've just been concentrating on winning these Test matches first and then I'm sure we'll start looking at who's going to be playing in the Ashes later in the summer." 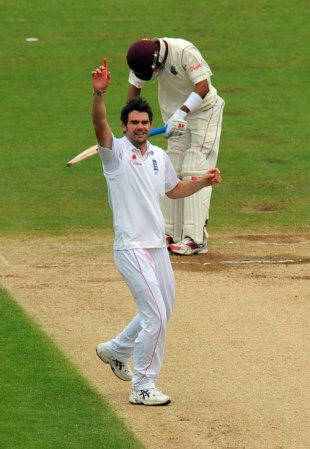 Anderson's swing bowling was one of the stand-out features of England's victory as he continued to demonstrate his development into a top-class pace bowler. He followed his first-innings haul of 5 for 87 with a final-day spell of 4 for 18 from 11 controlled overs as he made the ball move both ways at will. He produced two stunning deliveries to remove Jerome Taylor and Sulieman Benn as both batsmen had their off stumps uprooted by balls which moved late. It was overdue reward for Anderson who, like all the pace bowlers, endured a frustrating series in West Indies on flat pitches. Anderson is now firmly established as the senior pace bowler in the ranks, a responsibility he appears to thrive on as he continues to grow as an international cricketer. He has now risen to a career-best seventh in the ICC world rankings, and it is easy to forget he was actually left out of the side for the first Test at Sabina Park during the previous series. "My control is improving each game I play and if I can stay fit and continue working hard then the control should get better and better," he said. "If anyone gets a run in the side it's going to help their confidence, but the fact I've had the run would suggest I've also been doing something right so that's also encouraging." However, Anderson was also quick to praise his new-ball partner, Stuart Broad, who played a key role in Durham by removing Shivnarine Chanderpaul and Ramnaresh Sarwan in the first innings. "If you look at it on paper I've got the most caps but Stuart has a 30-year-old's head on his shoulders and he's also someone that Straussy can also chuck the ball to if he needs someone," he said. "I think we've got a good unit and hopefully we can continue to grow as a bowling unit." One of highlights of the short series was Anderson's ongoing duel with Fidel Edwards and they are unlikely to back down during the one-day series. Sulieman Benn wasn't been shy of having a few words in the field, either, and Anderson gave him a little send-off on the final day when he suggested to Benn that he should keep quiet. Anderson could be in for an interesting time in the one-dayers because West Indies have called up Runako Morton, with whom Anderson had a shoulder-barging incident with at Trent Bridge in 2007. Anderson was fined 50% of his match fee for the confrontation, but given the form he is in now it would be unwise for West Indies to wind him up too much.